At the Whitman Baltimore Expo, June 20-23, the Stack’s Bowers Galleries auction and the Presidential Coin & Antique Company exonumia auction will be among the highlights. The official Baltimore Expo auction features U.S. coins and paper money. Auction lot viewing begins at 2 p.m., Monday, June 17, in room 327. The Presidential Coin & Antique Company will hold its 83rd sale. Most major areas of exonumia will be well represented. The sale will start at 5:30 p.m., Saturday, June 22, in room 331. Dealer setup will take place on Thursday, June 20 from 8 a.m. until noon. The Expo will open to the public at noon on Thursday and at 10 a.m. on Friday, Saturday and Sunday. Early Birds will be admitted at 10 a.m. on Thursday and 9 a.m. all other days. Friday afternoon the Maryland State Numismatic Association continues its annual distinguished lecturer series. At 2 p.m., Karen M. Lee, a curator of the National Numismatic Collection housed at the National Museum of American History will speak about The Private Sketchbook of George T. Morgan: America’s Silver Dollar Artist Gift, revealing the man behind the coins, exploring Morgan’s never-before-published personal sketchbook, family photographs and documents. Join them in room 330. Join award winning journalist and retired editor of Coin World, Beth Deisher at 1 p.m., Saturday, June 22 in room 331. She’ll speak about Cash in Your Coins: Selling the Rare Coins You’ve Inherited. This presentation is for anyone who’s inherited a collection (or hoard) of old coins. Deisher will show you how to identify what you own, how to create an inventory, how to pick out extra-valuable coins, how to value a large estate, and other important and valuable lessons. The book will be available for sale before the program, and immediately following it, Deisher will be available to autograph her book. The Numismatic Guaranty Corporation is conducting an introduction to grading class all day Saturday, June 22. The class instructor is NGC grader John Schuch II. Advance registration is required for the class. For more information, call 1-800-642-2646. Fellowship of Christian Coin Dealers, 7:30 a.m.
Liberty Seated Coin Collector’s Club, 9 a.m.
arber Coin Collectors’ Society, 3 p.m. The John Reich Collectors Society, 4p.m. Maryland Token and Medal Society, 11 a.m. Early American Coppers Club, 1 p.m.
“Introduction to Medieval Coins: From the Fall of Rome to the Renaissance” with Mike Markowitz, 3 p.m. 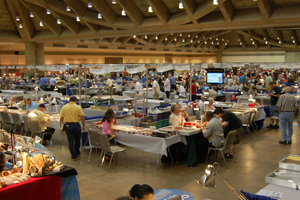 When the Whitman Coin & Collectibles Baltimore Expo gets underway you’ll find all that, and more. And here’s the really amazing thing—it’s absolutely FREE to attend. So, have fun visiting with some of America’s most famous numismatists, view amazing historic rarities, and walk around the bourse to capture special treasures for your own collection. The welcome mat is out for you!